I've added a sigprogs page listing some of the signature programs I've written over the years. 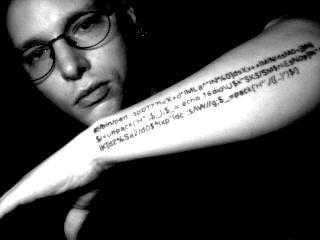 As I was researching that, I discovered pictures of one of my programs, a variant of the RSA in 3 lines of perl, that two people have gotten tatooed onto themselves. I remember sending that in, but until today I hadn't realised that my keystrokes had actually translated into needle sticks for two people, Youch! Anyway, I wonder how to represent this acheivement in my resume? 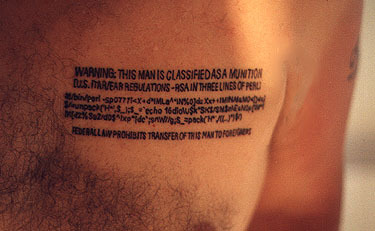 "Munitions tattoo artist"?